2.) Current marker systems do not work with GPS. Through SharedGeo’s efforts, it has been determined that both these problems can be solved by using a sign design that leverages the U.S. National Grid (USNG) – the U.S. portion of the worldwide Military Grid Reference System (MGRS) – and which conforms to various national and international display standards. 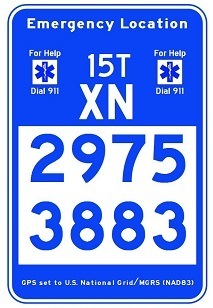 The result of this marker design effort, now known as a USNG Emergency Location Marker (ELM), is shown to the left and above. Because this sign style provides for the report of an emergency location based on a GPS coordinate system (USNG), response efforts are significantly enhanced.